Mr. Robot's Rami Malek won best actor for Bohemian Rhapsody. The Crown's Olivia Colman won best actress for The Favourite. Mahershala Ali took home his second best supporting actor Oscar on the same night HBO was airing his True Detective season finale. And Regina King, who's currently working on HBO's Watchmen, won best supporting actress for If Beale Street Could Talk. "It is the strongest indication yet of the blurring lines between film and television and a culmination in the process of television — once considered film’s far less prestigious ugly stepsister — evening the playing field," says Nellie Andreeva. "Just a few years ago, it was almost unheard of for an Oscar winner to do a TV series. In the current golden age of television and amidst a proliferation of premium/streaming networks, that is a regular occurrence." 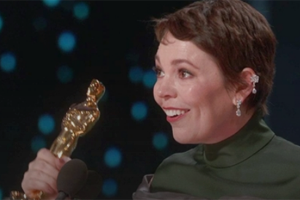 Olivia Colman's response to winning an Oscar was everything an awards speech should be: "Seemingly unrehearsed, sincere, emotional, effortlessly comic"